Stratasys Ltd., the world leader in 3D printing technology, has announced on Wednesday that it will acquire startup company MakerBot Industries LLC through a $403 million deal. Barely four years old, MakerBot has already made a name for itself in the 3D printing industry. The company is fresh and hip, catering to hobbyists and enthusiasts. It’s no wonder the veteran Stratasys took interest. Founded in 2009, the Brooklyn-based company helped develop the desktop 3D printing market and has built the largest installed base of 3D printers in the category by making 3D printers highly accessible. The company has sold more than 22,000 3D printers since 2009. Although Makerbot has made 3D printing technology more accessible. 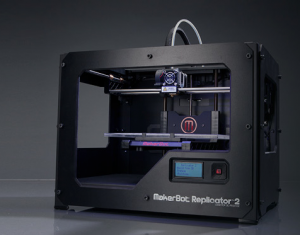 The MakerBot Replicater 2 sells for $2,799 and in the last nine months, the unit accounted for 11,000 of MakerBot’s sales, according to the press release. According to the terms of agreement, Stratasys will initially issue approximately 4.76 million shares in exchange for 100% of the outstanding capital stock of MakerBot. The proposed merger has an initial value of $403 million based on Stratasys’ closing stock price of $84.60 as of June 19, 2013. MakerBot will also remain as a separate subsidiary, preserving its existing brand and management. “MakerBot’s 3D printers are rapidly being adopted by CAD-trained designers and engineers,” said David Reis, Stratasys CEO. “Bre Pettis and his team at MakerBot have built the strongest brand in the desktop 3D printer category by delivering an exceptional user experience. MakerBot has impressive products, and we believe that the company’s strategy of making 3D printing accessible and affordable will continue to drive adoption. I am looking forward to working with Bre,” added Reis.